911uk.com - Porsche Forum : View topic - Cayenne suspension options clarified ? 911uk.com Forum Index > Cayenne (2003-) & Panamera (2009-) > Cayenne suspension options clarified ? Posted: Fri Sep 29, 2017 5:15 pm Post subject: Cayenne suspension options clarified ? so silver lever on the left what`s that for ? PASM fairly straightforward three buttons-option not fitted as standard ? 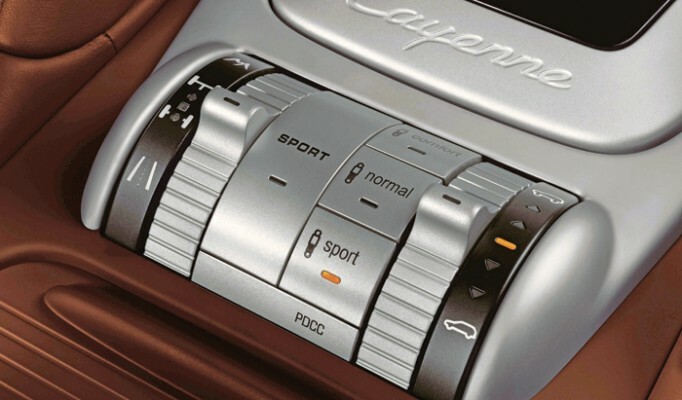 silver Lever on the right, controls the Air suspension ? Left .. diff lock front and rear for off road. 3 button is air suspension stiffness .. how hard the shocks are . right is air suspension height .. low setting for loading the boot .. high for off road . This has the sports setup as well. PDCC is an option , not a standard fit with air suspension . Spot on demort can you have the three settings with PASM without the air suspension thought I had seen some cars with the three buttons but not the air suspension lever ? When it comes to options then we are getting a little out of my comfort zone ! I only fix then after all ..
As far as i know you can have PASM without air and it will have the 3 buttons . Personnelly i would always recomend having air suspension but thats a personnel preference and i dont actually own one , the only thing that might not be of use is PDCC .. but it does stiffen the car up in cornering and is a must if any offroading so maybe a plus .. and a fully loaded Cayenne is always going to be easier to resell i would have thought . you and me both mate driven 4x4`s for 30 years it was dead simple with a lever for high low box and over a bit for diff locks ! Aww tell me about it .. short wheel base landrover .. steering wheel the size of a bus tyre .. wont go above 50 mph but you could do that off road as well ..
Technology sigh .. it used to be so easy to work on these .. dam can bus , computers and software these days .. getting far to old for this lol . All of them will have the left lever which is the 4 wheel drive 'control' I think its exact function varies accordingly to model, in that we have the 3l Diesel and we don't have the diff locks, but other models do. Think on ours we've permanent 60/40 split, and the offload mode alters what PSM does. Middle lever is PASM, and that can be fitted with steel or air, think they all have Sport, Normal & Comfort. Think the handbook says Normal for road, sport for the obviously stiffer throw it about set up, and Comfort is off road. Ours runs in Normal most times, and pop it in Sport if I'm pushing it a bit or its very twisty, does firm everything up. Air has a number of heights. Lowest is loading, then low setting (ours is usually in this mode as it looks better), normal setting, then 2 higher settings which are for off road and (I guess) tougher off road respectively. Air also takes road speed into account, so it won't allow these higher off road settings above certain speeds, and moves you to normal. It automatically moves you from normal to lower height if you go over about 85mph for around 10 secs or longer, and moves you back as you drop below about 50mph - but it stays in lower if you have actually selected that height. It also goes to lower as soon as you hit 100mph. There is also a further even lower setting between lower and loading which is not user selectable, but is automatically selected if you go over 130mph for about 40secs. Lastly you cannot drive in loading - if you accidentally move off its supposed to raise itself up straight away to avoid damage - never tested that for obvious reasons. Not got PDDC so no knowledge of it.